As today is Bash Louisiana’s Leading Newspapers Day at The Hayride, we have to give equal treatment to the Baton Rouge Advocate. While Monday’s editorial column discussing the falling chunks of mortar which have created a safety issue that has prevented visitors from using the front entrance – something which is being addressed by the construction of a metal shed protecting that entrance from wind-driven projectiles coming off the capitol’s facade – correctly recognized the symbolism inherent in the situation, the editors mistook what it actually symbolizes. This wasn’t as reprehensible or off-base as the Times-Picayune’s smear of Eddie Rispone for having hired a respected pollster who had done work on the Trump campaign in 2016, or the Advocate’s hit piece taking Ralph Abraham to task for how many hundreds of thousands of dollars he donated to St. Jude or a charity supporting wounded veterans, but it’s instructive to note the wrongheadedness of Louisiana’s purported newspaper of record for its entire approach to government in this state. Visitors can now see the steel-covered walkway being installed at the State Capitol to protect visitors from getting plunked in the head by mortar chunks falling off the 86-year-old building. It’s a vivid testament to the backlog of deferred maintenance plaguing state government. There’s never enough money to fix anything, and politicians looking for attractive legacies often prefer to build new stuff rather than caring for what’s already around. It’s why fixing things — not just something as prominent as the State Capitol, but ordinary things like college buildings and roads and sidewalks — seems to always take a back seat to other projects. 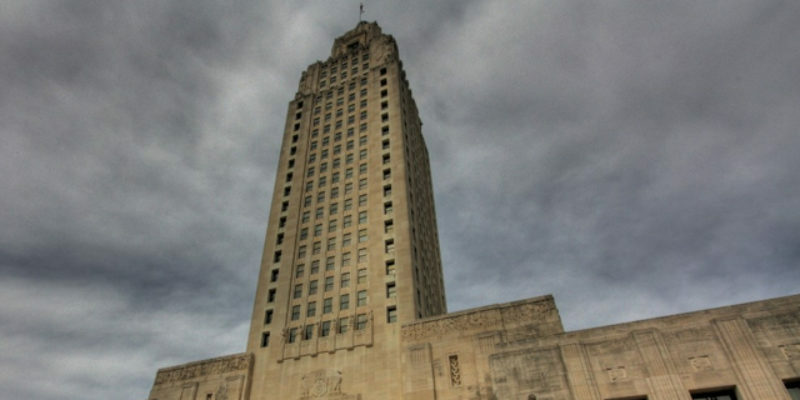 In Baton Rouge, the state doesn’t have the $40 million to $60 million necessary to fix the disintegrating mortar and fixtures that hold about 8,500 limestone panels, each weighing more than a ton, to the steel skeleton of the 34-story capitol. The current plan is to erect what officially is called a “temporary protective structure” that will shelter visitors from falling building bits. The steel shelter will allow the main entrance to reopen in February after being closed nearly three years ago because of safety concerns. Except for a narrow passage to the top of the “monumental stairway,” the granite steps, each engraved with the name of a U.S. state, will be mostly closed and barricaded. That’s not good news for tourism in Baton Rouge, since the tower that Huey P. Long built is something that visitors to the city want to see. The larger issue of deferred maintenance problem is something that candidates for governor and Legislature should be questioned about this year. Is there going to be a willingness to raise money to pay for the deteriorating roads and bridges in the state? The state gasoline tax hasn’t been raised in 30 years, and it now pays for about half the work that it did in the 1980s. That’s another obvious case of deferring the pain of a tax increase by increasing the pain of bad roads for motorists. To give credit where it is due, Gov. John Bel Edwards and the Legislature have wrestled with these problems in a small way. The state’s colleges and universities have nearly $2 billion of deferred maintenance projects, such as roofs that need to be replaced, classrooms that need to be cooled, and leaks that need to be stopped in libraries. At the governor’s request, there has been more emphasis on college repairs, but not enough money is available. What’s wrong with this? Well, for one thing it doesn’t follow the symbolism of our crumbling state capitol to its true source. Louisiana’s state capitol building is falling apart because it was built in the same way the state’s governing structure was built – hastily, in a slipshod manner, with graft and corruption hounding the process to its core, and with fundamental errors inherent in the design. Nearly 100 years on, such a structure is inadequate to withstand the test of time and is visibly falling apart. Yes, we could appropriate $60 million to shore up the failing structure, just like John Bel Edwards has raided the pocketbooks of decent Louisianans for billions of dollars in taxes to short up Louisiana’s failed structure of government. Both are short-term fixes that will kick the can down the road awhile, only to see that failure coming back again with a larger threat and more urgency. The Capitol was built by the corrupt wannabe dictator Huey Long as a skyscraper, the tallest building in Baton Rouge. The public-sector arrogance associated with a desire to make Government rise above all is a symbol which has held Baton Rouge, and Louisiana, back ever since, and worse, thanks to Long’s political and economic model which Louisiana has never fully shaken it’s the state government which rises above all others here. Our local governments are very much like the baby pelicans on the state flag; helpless, parasitical and fully dependent on the mama pelican for sustenance. They don’t fully pay their cops, firefighters or teachers without significant contributions from the concrete phallus in Baton Rouge, they’re hamstrung by the nation’s highest homestead exemption and thus have stunted property tax bases, they don’t have the control of local roadways they should have because so many of them are designated state highways. As a result Louisiana is covered with exceptionally poorly-run cities and parishes which have never grown up, and their poor operation places too much of a strain on the governor and Legislature to do their work for them. And thanks to Edwards, we’ll be further crushed by his poorly-thought-out Medicaid expansion, which “covers” some half-million new people with the worst health insurance imaginable and functionally no better access to the state’s health care system than they had before (worse, actually, as most of Edwards’ new clients on the government dole had private insurance before signing up to his Medicaid plan). Meanwhile his Medicaid expansion, which will result in more than two-fifths of the state relying on the government to provide them with healthcare, making this the state with the most socialized medicine in America, will cost Louisiana a compounding $100 million more per year, every year, going into the future. That’s the shape our fiscal house is in. Try not to get hit by the falling facade. This is what Huey Long left us, and it is disintegrating. That’s why Louisiana, despite its vast mineral and agricultural wealth and its unique, highly-marketable culture, languishes at the bottom of all the public-policy metrics. We are America’s Venezuela or Cuba – crushed by an unworkable socialist mindset we’ve never abandoned just as visitors to the Capitol are in danger of being crushed by falling chunks of Huey Long’s architectural folly. Rather than spending $60 million – or $30 billion – propping up that building or what it represents, perhaps it’s time to consider something the Advocate seems to think is a bad idea. Namely, replacing that which is in disrepair with something else entirely. Why not a proper state capitol building with a proper rotunda, constructed not in an architectural style suggestive of early 20th century collectivism but rather in the principles of the Enlightenment this country was founded on? And how about a new state constitution, and a thorough reform of our governing model, to match? Maybe that way we can avoid the falling chunks of Huey Long’s legacy and not be reminded of its utter failure every day.